I ♥ ♥ ♥ SUSHI! Together with pesto pasta, a bag of corn chips and a box of Putong Ube, sushi one of my all-time favorites and definitely my ultimate comfort food of choice too. This is also why I just love dining at rotating sushi restaurants as I really enjoy choosing and feasting on dozens and dozens of fresh hand-rolled sushi and sashimi. Here in the Lion City, my go-to place for good but very affordable sushi is Ichiban Sushi and its sister restaurant, Ichiban Boshi. I'm not really sure what the difference between the two are as I'd see one or the other in most of the major shopping malls all over the country. 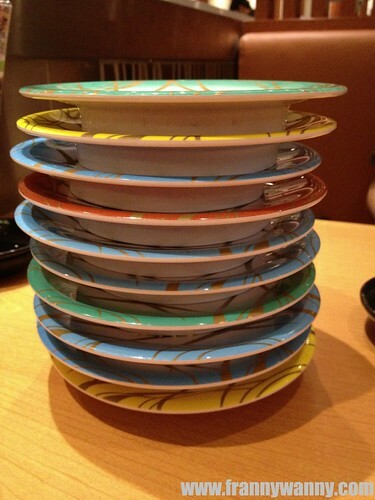 Both has that sushi conveyor belt, the same set of bento boxes and donburis and pretty much the same menu. 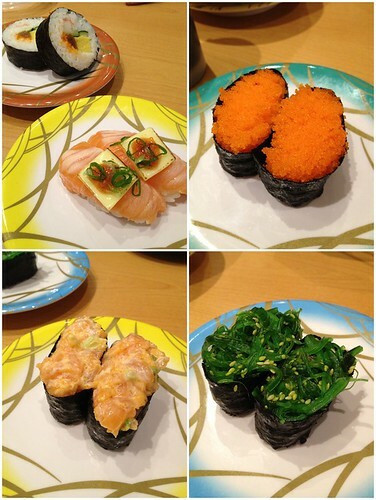 I have this notion though that Ichiban Boshi is slightly a notch higher than Ichiban Sushi but I may be wrong. Does anyone know what's the difference between the two? 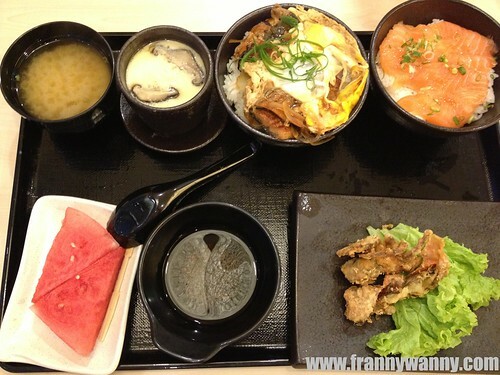 It's a complete set that consists of Spicy Salmon Sashimi Rice Bowl, Mini BBQ Eel with Egg Rice Bowl, Soft Shell Crab Tempura, Chawanmushi, Miso Soup and Fruits. Paul and I love sharing this as it has all of our favorites! Spicy Salmon Sashimi for me and the BBQ Eel for him. He loves the really tasty Soft Shell Crab Tempura too! As for me, I'm just happy having my sashimi with a mini bowl of steamed chawanmushi (egg custard with seafood). It's a complete meal for one really hungry person or even for two! On days wherein we just want to splurge a bit and to just stuff ourselves silly with sushi and sashimi, we'd go for the sushi/sashimi conveyor belt. I just noticed that rarely do they bring out tuna or salmon sashimi and it's normally just filled with hand-rolled makis, ebi sushi, tamago or even baby octopus. If you're a big salmon sashimi fan and you couldn't find it here, feel free to just order a la carte for the same price. 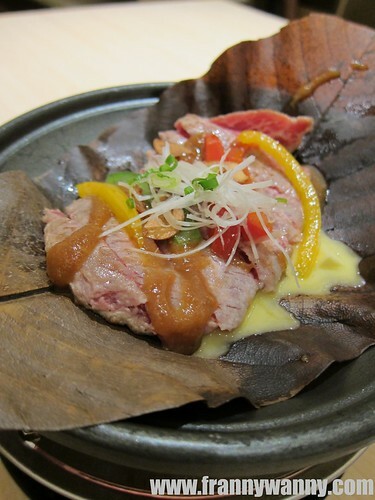 Oh, this is just one of the yummiest things that I've tried at Ichiban Boshi. 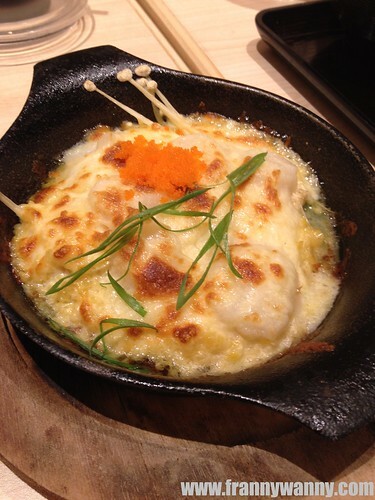 How can you resist this hot skillet filled with plump Japanese scallops which were covered with melted, gooey cheese and sprinkled with delicious ebiko. Every bite just felt like heaven. Sizzling Wafu Houba Yaki Once, I was craving for beef so we tried their Wafu Steak. I love how the thinly-sliced beef simply melted in my mouth as I enjoyed how juicy and tender it was. I have to say that Ichiban Sushi/Boshi also gives high regards to presentation that each meal is really a feast also for the eyes. This one comes in a piping hot skillet where you get to sear the beef to your liking. One thing that we like about Ichiban Sushi and Ichiban Boshi is that they have a stamp card where every S$20 spent gives you a stamp and after a certain number of stamps, you can redeem for a complimentary starter/side dish/dessert or go for the grand raffle draw at the end. 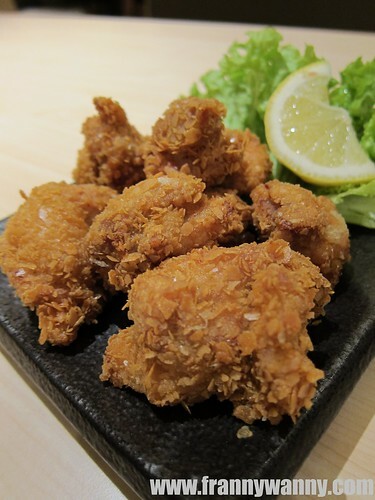 We were able to redeem our stamps for a plate of Chicken Karaage. While it may look really simple and ordinary at first glance, we really enjoyed biting into this crunchy deep-fried chicken fillet which was pretty flavorful and addicting. Ichiban Sushi has 10 branches around Singapore while Ichiban Boshi can be found in any of these 11 outlets.